The Bold and the Beautiful (B&B) spoilers for Wednesday, March 13, tease that a bombshell is headed for Liam Spencer (Scott Clifton) and Hope Spencer (Annika Noelle). 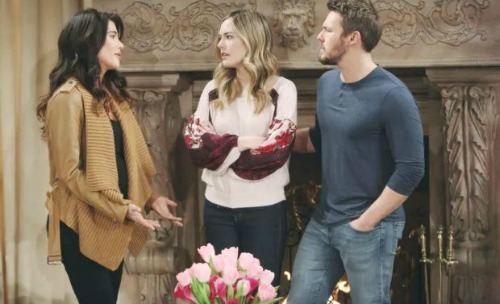 They’ll be surprised when Steffy Forrester (Jacqueline MacInnes Wood) wants to talk to them about her future – as well as the future of “Lope.” They’ll be even more surprised when Steffy reveals she’s leaving for Paris! Steffy will point out that Hope has been in a dark place since Beth Spencer’s “death.” She’ll completely understand why, but she’ll also feel like she’s hindering the healing process. Steffy knows Hope needs Liam right now, so she’ll push them to work on their marriage in her absence. She’ll think Hope can relax and move on if a “Steam” reunion is truly off the table. You can’t get any more off the table than taking half of that pairing out of the country. Of course, Steffy will want to take her girls with her. That’ll crush Hope for a couple of reasons. For starters, Hope was already pressuring Liam to be a family with Steffy, Kelly Spencer (Zoe Pennington and Chloe Teperman) and “Phoebe Forrester” (Isabella de Armas and Redford Prindiville). Hope pushed Liam to be a full-time father, so she’ll feel guilty when Steffy insists on taking the babies out of Los Angeles. This is the opposite of what Hope wanted. She may beg Steffy to stick around, but Steffy will believe leaving is for the best. Hope has become too attached to “Phoebe” anyway, so Steffy will think the distance can help with that. Still, it’s another reason Hope will be left shattered. Liam will eventually accept Steffy’s decision and Hope will have to do the same. They’ll realize they need to take Steffy’s advice and work on their relationship. Unfortunately, it could take far more work than they ever expected! B&B viewers will see plenty of struggles for “Lope” in the coming months. For now, Wyatt Spencer (Darin Brooks) and Sally Spectra (Courtney Hope) will become part of the Cupid crew. Justin Barber (Aaron D. Spears) and Donna Logan (Jennifer Gareis) are working on a matchmaking plot, so they’ll recruit Sally and Wyatt as secret helpers. The Bold and the Beautiful spoilers say they’ll join forces as they move toward a “Batie” reunion goal. Bill Spencer (Don Diamont) and Katie Logan (Heather Tom) will figure out they’ve been set up later this week, but the plan will pay off. Love will be in the air again soon enough, so The Bold and the Beautiful fans won’t want to miss what’s in store. We’ll give you updates as other B&B news comes in. Stay tuned to the CBS soap and don’t forget to check CDL often for the latest Bold and the Beautiful spoilers, updates, and news.